Two comments by Mr Highball himself, Jörg Meyer, “you can highball any cocktail”, and “a highball is a short drink made long” left me wanting to try highballing previously short classic cocktails. Something I remembered recently when Schweppes discussed cocktail ideas with me. 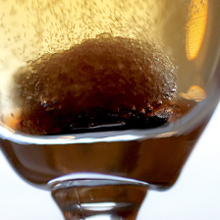 After all, the definition of a highball demands carbonation and that's what Schweppes is noted for. Remember, Schweppes created the carbonated drinks industry from tonic waters to cola so the folks at Coca-Cola European Partners, who make Schweppes here in the UK know a thing or two about carbonation. 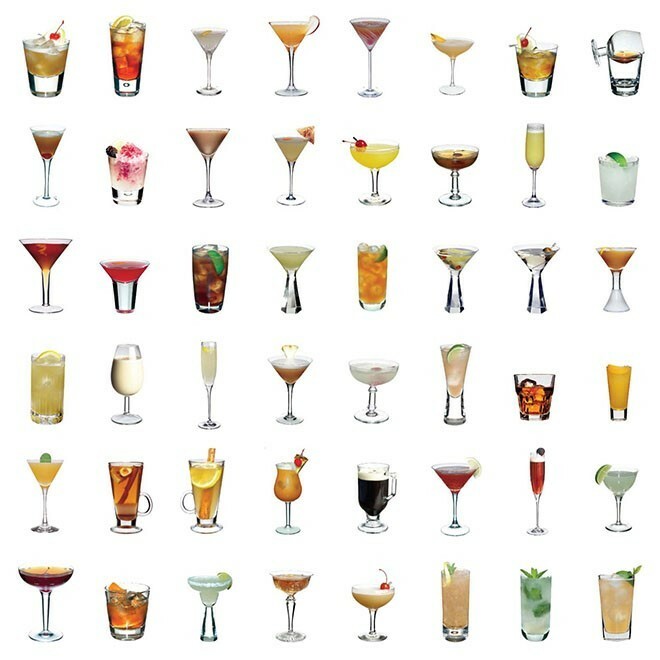 Hearing about my plans to experiment with highballing classics they lined up some of their expert partners and bartenders that they work with to join me in some cocktailing sessions and over the rest of 2018 I'll be updating this page with the results of these sessions. Mihai Ostafi and Ali Ali from Oriole Bar met with Simon Difford at The Cabinet Room in London. Method: Throw first five ingredients with ice. 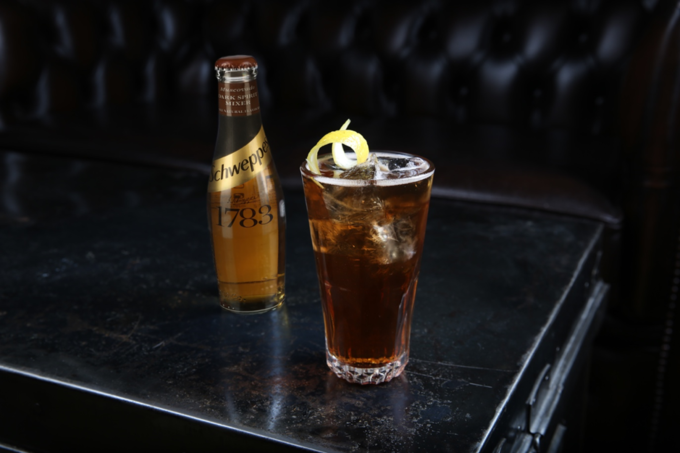 Strain into a chilled glass, fill with ice and top off with Schweppes 1783 Muscovado. 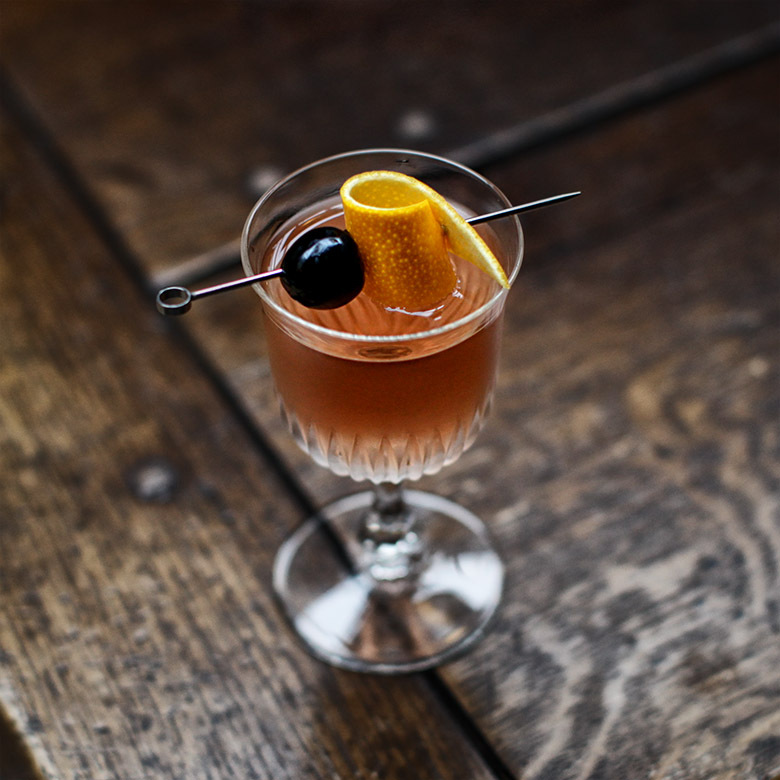 Method: Fill a mixing glass with first four ingredients, add ice and stir briefly. 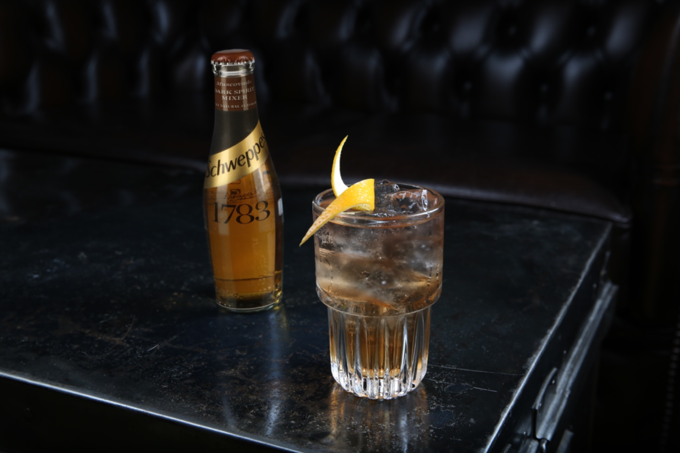 Double strain into chilled glass, add ice and top off with Schweppes 1783 Muscovado. 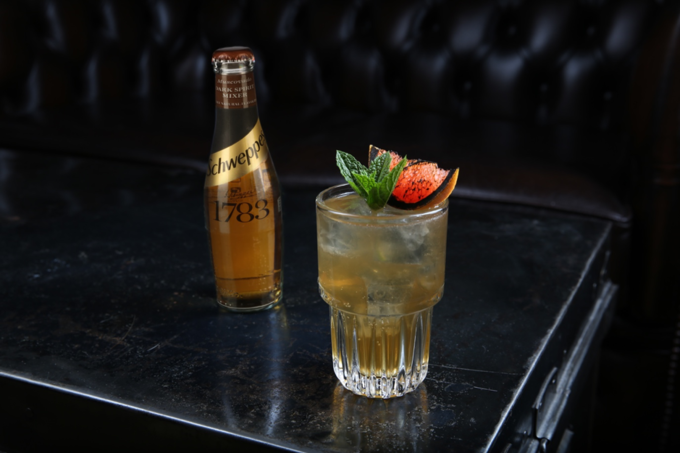 Method: Shake first five ingredients and strain into a chilled glass, fill with ice and top off with Schweppes 1783 Muscovado. Method: Build first six ingredients into a chilled glass, fill with ice and top off Schweppes 1783 Muscovado, stir briefly then serve. 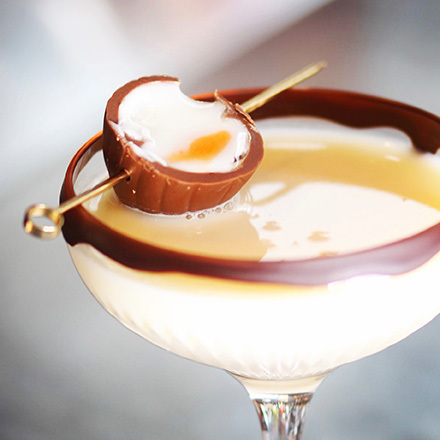 Garnish: Lemon zest twist caramelised on both ends to resemble a tie. 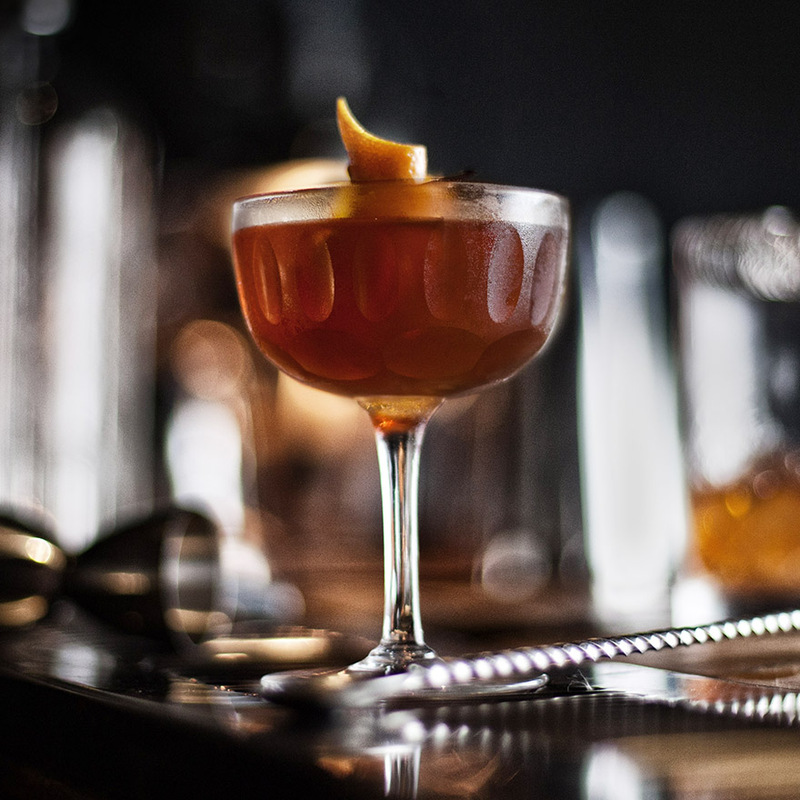 Method: Build ingredients in a glass, fill with ice and top off with Schweppes 1783 Muscovado. In June, Dmytro Grypachevskyy and Lucian Obreja, both bartenders at L'Ortolan, the Michelin Starred restaurant in Reading, Berkshire popped into our place for an afternoon at the bar, and continuing my quest to highball classics, I made them a highballed Corpse Reviver and Vesper. 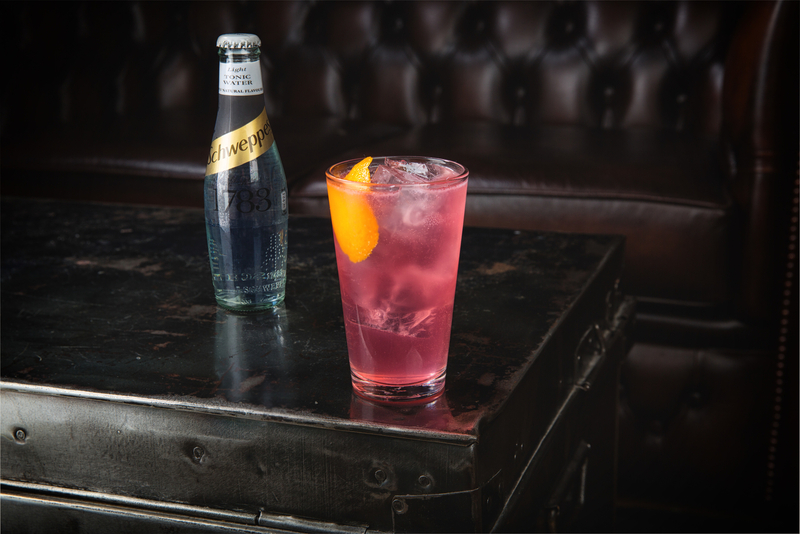 Following much experimentation with ratios and which of the Schweppes range best suited each drink we arrived at the following recipes. Due to the quinine in the Kina Lillet used in the original Vesper, highballing a Vesper with tonic water really appealed to me and the result, something of a G&T and Vesper lovechild, was indeed both delicious and refreshing. Method: SHAKE first 3 ingredients with ice and strain into ice-filled glass. TOP with salty lemon tonic. Method: SHAKE first 5 ingredients with ice and strain into ice-filled glass. TOP with Salty Lemon Tonic. 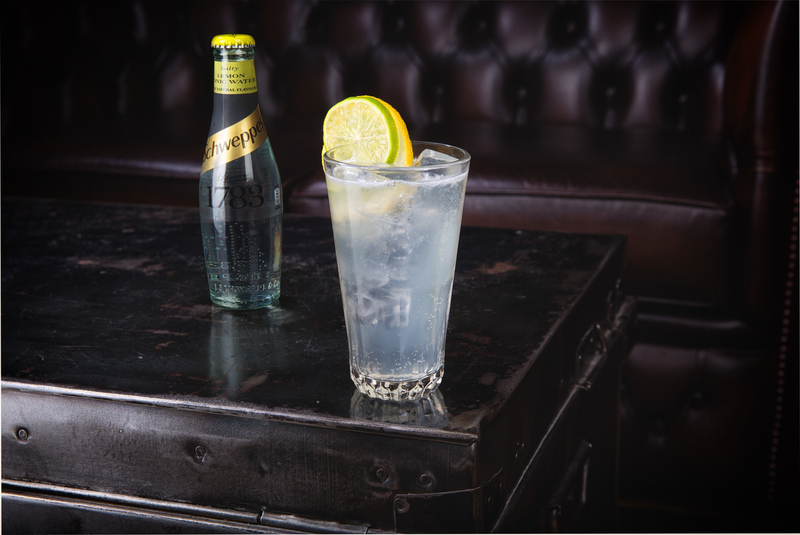 Jayson Jansen van Vuuren and Callum Whitehead from Liquid Chefs have worked closely with Schweppes for years and they joined me one afternoon in April, and after much chat and mixing, the session resulted in these two highballs we highly recommend. 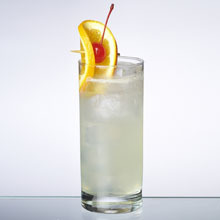 Margarita is a Spanish girls name, so it seemed that the elongated highballed version of this classic cocktail should be called "Largo", Spanish for long. 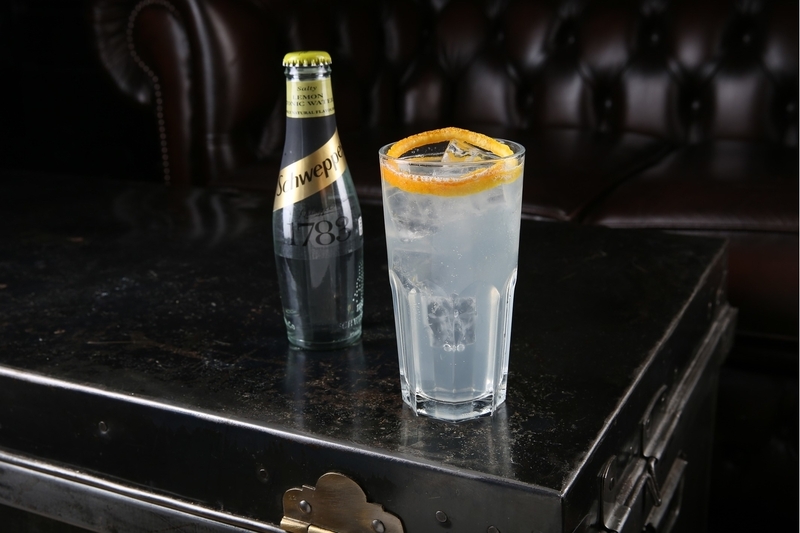 Due to its traditionally salty rim and the Mexican custom of adding salt to drinks, Schweppes 1783 Salty Lemon Tonic was a natural choice of carbonate. Remembering a Margarita session with Tomas Estes where we found that 50% lime and 50% lemon juice made a great Margarita, I also like the lemon notes that the tonic contributes. The finished Largo Margarita is one of the tastiest Margaritas I have encountered and a particularly refreshing version of the drink. Callum suggested highballing the Cosmo as for a generation of cocktail drinkers, this was the iconic drink they first encountered, and for many it's still a go-to. 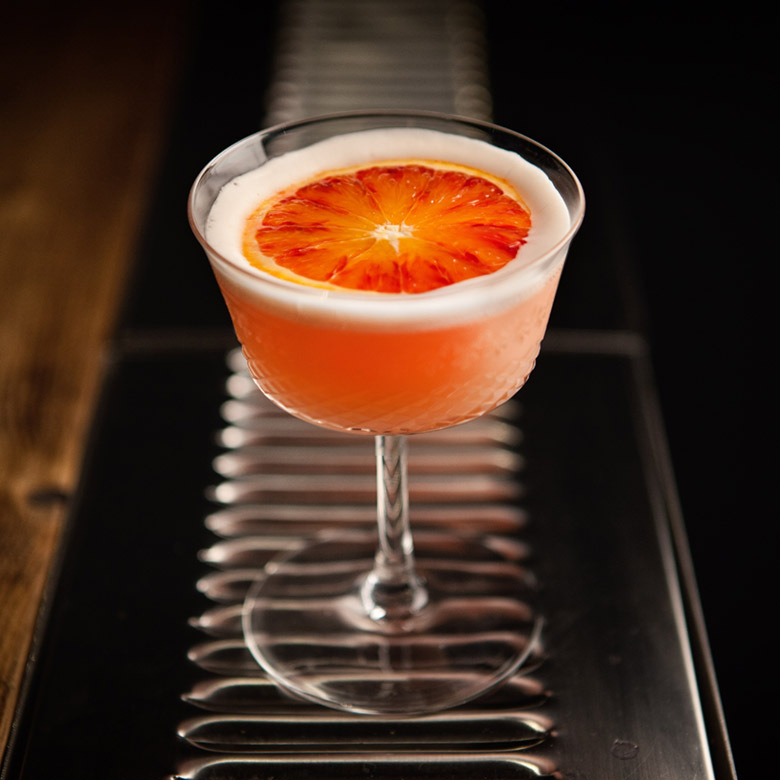 Although now out of vogue, it remains a great drink and we found that after a little tweaking it highballed well. 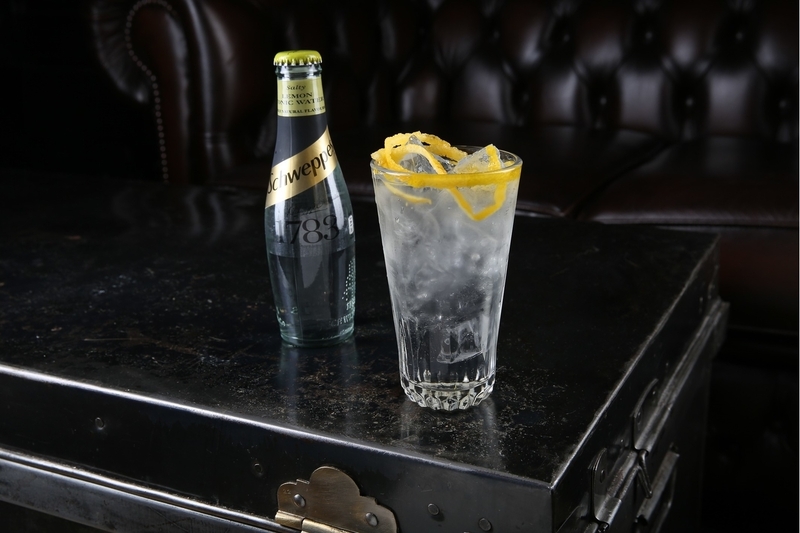 We originally used Schweppes 1783 Crisp Tonic as our carbonate, but Jayson recommended we try Schweppes 1783 Light Tonic due to its zesty grapefruit flavour profile and it worked brilliantly. Method: SHAKE first 4 ingredients with ice and strain into ice-filled glass. TOP with tonic and briefly stir.